We will learn each state of moisture and significance of them. This is an artificial condition where prolonged drying of aggregates in oven reduces all moisture from them. This condition is sometimes called bone-dry. Thus the aggregate is completely dry on the other hand means fully-absorbent. This is usually done in laboratory for inspecting different properties of aggregate. The aggregate have some moisture but dry at surface. The moisture content is less than saturation. That means there have some degree of absorption affinity. Usually known as SSD. This state of moisture defines all pores of aggregate are filled but have a dry surface. Thus the aggregates are saturation-surface dry. These have moisture in surface looks darker and which leave water to concrete mix. These four states are very important in proportioning concrete mix. In mix design there has a step known as moisture adjustment where the moisture content of aggregates is considered to adjust W/C ratio. That is; if aggregates are in unsaturated water should be increased, in case of moist aggregate, the change is opposite to unsaturated condition. 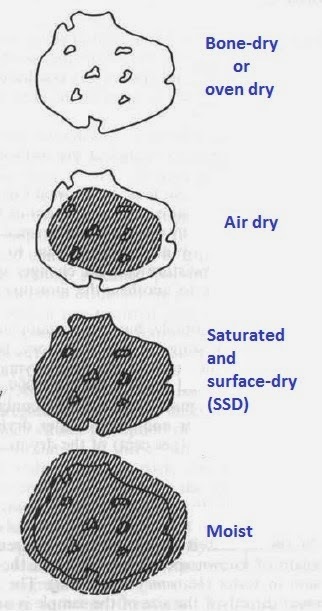 As SSD is an ideal condition and difficult to maintain in aggregate, moisture adjustment is required.